Throughout my journey in Thailand I have learned about the culture through experiences and observations. 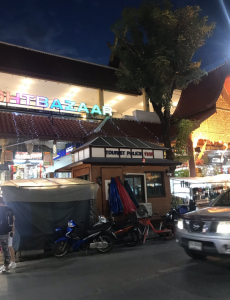 In this blog post I will be focusing on the atmosphere and way of life I have examined in the Thai markets and how they compare and contrast with markets in America. 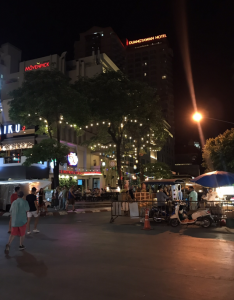 When we first arrived to Bangkok, I ventured down the street with some of my classmates to explore the area near our hotel. My first observation was there was an overwhelming amount of stores and produce stands in a compacted area. I began wondering how certain stands compete with one another in the produce market due to similar products offered. My second observation was the prices are extremely cheap, and many stands give the same prices for produce due to a price competition. 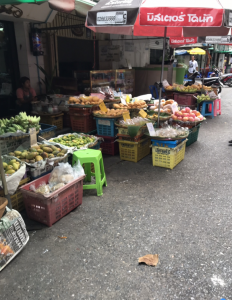 In Bangkok the stands and markets have minimal setup costs and most of the business comes from fresh produce, which is rare to find in Minnesota unless you find a farmers market in the summer. In America, it is often hard for small pop up businesses to stay in the market because of the competition and high prices to keep a store running. For similar products in America, the prices can vary if the stores are not close to one another. The market area in Chang Mai was larger than the market I observed in Bangkok. There were more products offered such as art, clothes and other items being sold. When my classmate and I were walking down the street, the vendors were extremely aggressive and were trying to pursued us to purchase products at an extremely high price. Acharn Cat informed us to bargain with the vendors in these types of markets, because most of the time the price markup is excessive. After bargaining and purchasing a few products I wondered if locals are used to bargaining with vendors on the daily. I have never bargained in America; the price of a product is usually non negotiable. In Chang Rai, the market was smaller than I expected. The main difference I noticed between the markets in Chang Mai and Chang Rai was the attitudes and forceful actions from the vendors. In Chang Rai, the workers let you browse and examine products without trying to influence you to purchase the product which I enjoyed. The most captivating observation and comparison between the different markets and cities was the different atmosphere of the markets. 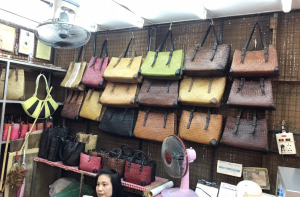 When first arriving to Thailand, I assumed most of the cities would have similar markets and ways of selling products to customers but I was wrong. It depends on the location (if it is a tourist spot like the market in Chang Rai versus a local area like the produce stand in Bangkok), the amount of competition between vendors and similarities of products, and the products you are searching for. 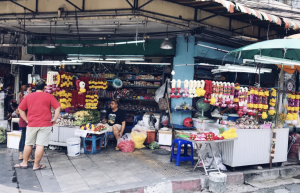 Purchasing produce and products in Thailand and America are extremely different and have more differences than similarities. Although bargaining can be exhilarating at times, I feel as if it would get exhausting to do daily. However, that is the culture in Thailand and I am still adjusting to that aspect of their communities.